Shea Butter is a natural fat extracted from the nut of the shea tree in West Africa. It is primarily sold in two forms: raw and refined. Raw Shea Butters are produced by mechanical crushing of the kernal. They are generally limited due to the content of free fatty acids which gives bad taste, strong color and odor. 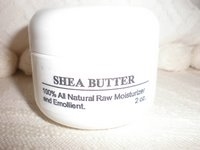 Refined Shea Butters are used in cosmetics, and soaps. Most commercially available Shea Butter on the market is refined using a hydrocarbon solvent. A vacuum extraction method is used to eliminate the fruity aroma. Shea Butter melts and absorbs at skin temperatures, making it ideal for skin creams, moisturizers, and emoillients. It is effective in treating: severly dry skin, rashes, eczema, psoriasis, fading scars, wrinkles, acne, blemishes, dark spots, skin discolorations, chapped lips, stretch marks, sunburn, small skin wounds, skin allergies, muscle fatique, aches and tension. Shea Butter also enhances cell regeneration and capillary circulation. The protective, anti-aging and moisturizing properties of Shea Butter come from the high natural Vitamin A and Vitamin E content and its unique fatty acid profile.